Press Pass Collectibles (PPC) is proud to announce Earvin "Magic" Johnson as our newest EXCLUSIVE memorabilia client. One of the most recognizable celebrities worldwide, Magic Johnson's career achievements include three NBA MVP Awards, twelve All-Star games, and ten All-NBA First and Second Team nominations. A five-time NBA Champion and two-time inductee into the Basketball Hall of Fame, Johnson was also honored as one of the 50 Greatest Players in NBA History in 1996. Johnson currently serves as president of basketball operations for the Los Angeles Lakers. 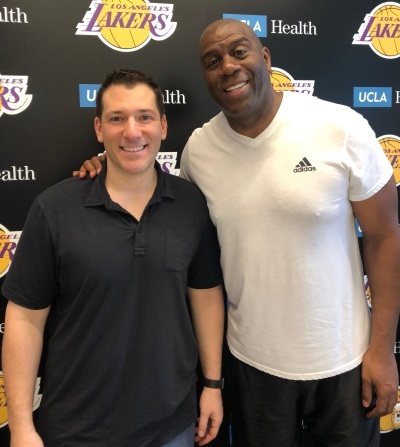 Bell Sports Marketing, parent company of PPC, has obtained Magic Johnson’s long-term exclusive memorabilia rights and will manage and control the marketing opportunities for authentic Johnson-autographed items. Johnson’s first-ever exclusive memorabilia deal, the partnership allows PPC to become the sole distributor of highly sought-after Magic Johnson autographed collectibles.